Posted on November 14, 2011 | Comments Off on Bridal Bouquet Preservation. Your wedding day is one of the most important events in your life, and you’d do anything to make sure you remember it all. While pictures and videos can do a great job with helping you relive those moments, you can also take something else away from that day, your flowers! 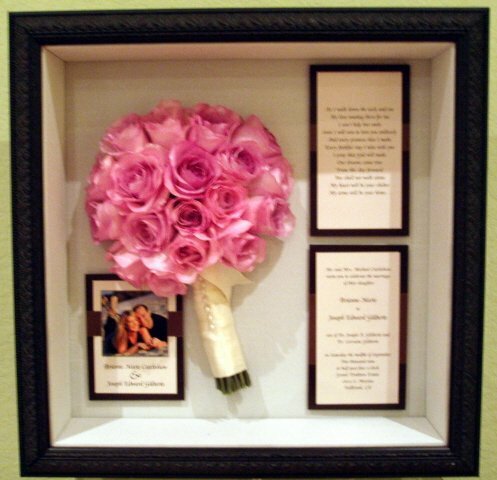 Your wedding bouquet can be preserved and displayed so that you can enjoy them for years to come. The Preservation process begins with the drying of your flowers. The drying method you choose depends on your budget and how you want your keepsake to look once it’s complete. This is the least expensive as you simply allow your flowers to dry up naturally. Air dried flowers will shrink considerably in size; they will lose their original shape and sometimes they will turn very dark or black. Many people trying to air dry have noticed mold or rotted flowers a few days after the wedding. While roses can be air-dried, lilies and orchids cannot be air-dried. This is an art form dating back many years. Many years ago heavy books were used to press flowers between their pages. 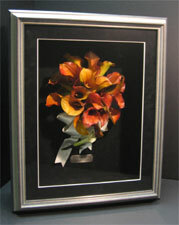 There are flower pressing companies that will create beautiful framed art using flower presses. 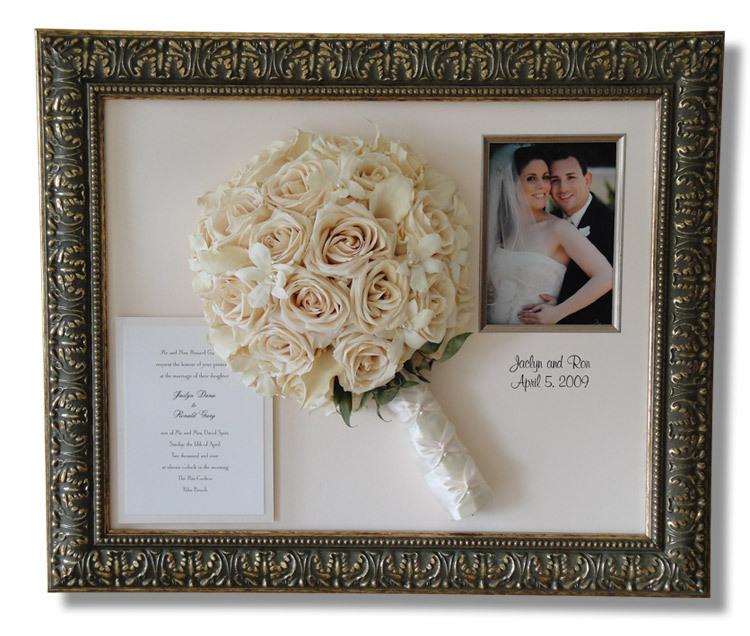 Framed pressed flowers are flat and allow the use of flat picture frames and other types of flat displays for decorating . If you do not like the look of three-dimensional flowers, then you should consider this drying method. This drying method can produce good results with some flowers but not all flower varieties, sizes and shapes of flowers can be maintained well in silica sand. First, check to see if your flower types are known to dry well in silica before selecting this drying method. You will need enough silica sand to bury each flower separately from your bouquet. Flower petals may detach with the weight of sand on the blooms. The cost of purchasing enough silica sand to dry a large wedding bouquet may approach the cost of just selecting a professional service to dry your flowers. This is the latest technology for wedding bouquet preservation. Orchids, lilies, and all varieties of flowers can be freeze-dried with near perfect, life-like results. Your flowers will keep most of their size, shape, and color throughout the drying process and look amazingly alive when dried. Unfortunately you cannot do this at home without having an expensive vacuum freeze drying machine. Professional freeze drying of your wedding bouquet will cost more than the other drying methods, but if you would like to save your wedding day blooms using the best drying method, then have your bouquet freeze-dried. The fee to freeze dry a wedding bouquet may not be much more than if you purchase enough silica sand to attempt the drying yourself. Preservation begins with the drying method used but preservation is really the methods and materials used to prolong and keep your flowers for years to come once they are dried.The better the drying method, the better preservation encapsulation your flowers should have. Proper encapsulation in “sealed” preservation framing ensures that the flowers will last their longest after they are dried. Not all flower drying companies may provide this level of preservation for your wedding flowers. This entry was posted in Budget & Finance, Uncategorized, Wedding Advice & Tips, Wedding Details, Wedding Flowers and tagged bridal, Budget & Finance, Layne Corban, marriage, Wedding Day, Wedding Details, Wedding Planning. Bookmark the permalink.